Ananka's Diary: This Can't Be Real . . . Can It? that has to be a violation of at least a dozen laws. this makes me really proud of my nonathletics!!! That may not necessarily make the swimmers swim faster, it will make them panic and lose control and balance! I predict a law suit in the near future for this man. What happens when you have to sircle swim or do fifties? (That is when you swim to the other side and then back) AHHH! THANK YOU ANNA! I'm printing this out for her anyway though. He is in australia so maybe it isn't against the law there or maybe they sighed a form. that is like something from a nightmare. UU- don't give her any ideas!!!! wow i would be so scared i would hire someone to go in while i chill in the locker room!!!!! Don't you get arrested for that kind of thing? I would have to say that coach either really really wants to win, or doesn't like the swimmers to much. I'm an aussie, and personally, i think that is CRAP. No offence. Seriously, I haven't heard of anyone doing that. LOL And if it's true, thankyou for putting it out there. I'm sure that's illegal. This, guys, is one of the many forms of 'polotics'. I think Flower Child is right. And I agree with ATCloak. 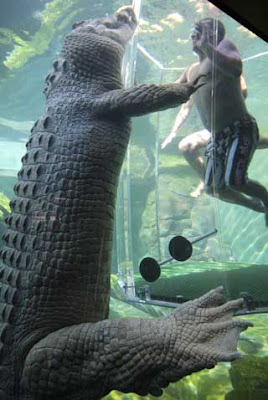 Back in reality I think that story is very unlikely for many reasons including 1)it takes many people to move a large crocodile and 2) chlorine in a swimming pool would be bad for the croc. A torn cloak: First off, cool name! Second off, I totally agree! I know it would make KS get a lot of readers, but it would also mess it up. I also think that it would be really hard to film. i know this is random but i just had a no-gangs assembly in school and they showed us infront of our whole grade, as one of my peers gettting her myspace hacked on big screen and how that relates to gangs(apparently thats how they recruit ppl) well i heard that(from my sources) that if your pc stuff is encrypted no one can hack or see it(not sure if thats true)but i must encrypt my inbox anyone know how to do it? Americans aren't all bad. Seriously. Ex. : Coraline. i agree w/ A Torn Cloak some things should be left on paper i mean the movie producers get the wrong people and screw it up BIG TIME. Its true(I think) I saw some thing about it on Ripley believe it or not. I think thay are NUTS!!!!!!!!! !